On the day of your procedure you will visit us in our office in Columbia to be treated by the same professional staff that you saw for your pre-operative evaluations. The surgical suite where your iLasik procedure will be done will be cool, so we recommend dressing warmly and comfortably. You will also need a driver for that day. Dr. McGarity provides Intralase™ technology for all-laser vision correction (iLASIK™). We are the only practice within a 90-mile radius to offer this technology. We own the equipment which is professionally maintained each day. We do not lease equipment. During the iLASIK™ procedure, the Intralase™ femtosecond laser quickly creates a laser-precise protective flap. The Intralase™ device is the first laser used during the iLASIK™ procedure. Intralase™ offers laser precision for corneas that were otherwise too steep, too flat or too thin for the older microkeratome LASIK procedure. The next laser is the VISX Star S4™ Excimer laser. Both of these devices are produced by the market leading LASIK company Abbott Medical Optics (AMO). The iLASIK procedure is the procedure of choice for NASA’s Astronauts. 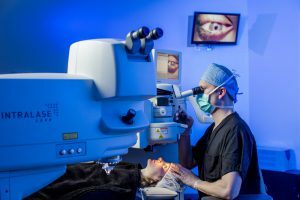 On the day after your procedure, you’ll be seen by our staff to make sure that your eyes are healing properly. You will also be seen the following week as the first few days are the most important in the healing process. 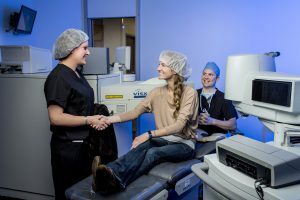 We typically ask that our patients take it easy during the days following their refractive procedure, and most are able to return to normal work duties on the following Monday. It’s important during this time to take it easy on your eyes, and to allow them to naturally heal.